District 19 Local Lodge 180 member, Stephen Kraning, and Colton Millis, the son of Local Lodge 696 member, Frank Millis, were recently selected as 2018 IAM Scholarship Award winners. Brother Kraning will receive $2,000 a year towards his bachelor’s degree in Business Management at Bellevue University. 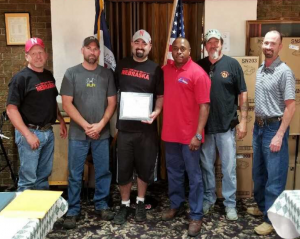 Kraning was presented his award during his local lodge’s monthly meeting in June. Colton Millis will receive $1,000 annually towards his bachelor’s degree in Mechanical Engineering at Old Dominion University. In addition to this scholarship, Colton received the Roman Mayfield Scholarship Award, which is the highest honor bestowed by the IAM Scholarship Selection Committee. This award represents both his excellent academic achievements and the spirit of volunteerism through his community service. Both recipients were selected from among 225 applicants in the United States and Canada. Their awards were made possible by voluntary contributions to the IAM Scholarship Fund from local and district IAM lodges. Left to right: Local Lodge 180 Secretary-Treasurer & District 19 E-Board member Scott Neal, President Cory Phillips, Scholarship Awardee Brother Stephen Kraning, General Chairman Derrick Battle, Local Lodge 180 Recording Secretary Jim Miller, Local Chairman Josh Cox. 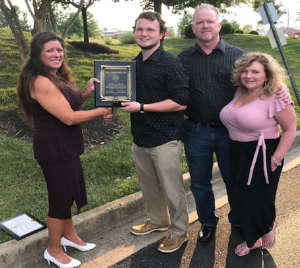 Left to right: General Chairman Lisa (Lee) Carter presenting the Roman Mayfield Scholarship Award to Colton Millis, his father and Local Lodge 696 member Frank Millis and his mother Renee Millis.